Happy to know you are feeling much better again - you must take it easy now & look after yourself. Note Jack Graham is going to drop me a line, shall be pleased to hear from him after so long. Was surprised to know the Empire had opened up again, are they running Variety or Revues? Its too bad you have'nt a TV set, am sure you would get a lot of enjoyment out of that, especially thru' the winter months + I get a lot of pleasure out of ours, as I'm not able to get out much - do'nt know what I'd do without it. Eda will send you a new lipstick next time she goes to Bullock's store, & I will try & find out about some more note paper for you - am not sure where it was bought, a friend of mine got it for me, so will have to wait till I see him again - he knows where to order it, I believe its made somewhere back East & they only print it by order. Anyway, will have some sent on to you as soon as I possibly can. I just wrote you recently, so not much to tell you dear. Please convey my love & best to Dolly, & same to you Trixie from us both here. gain the Season's greetings - take care of yourself. Enjoyed hearing from you again - often think of you - wonder how you are doing with the theatre. Am certainly pleased to know that bus. has improved & you're holding your own - I guess the exhibitor has rough going these days due the lack of good box office product, it must be a great problem. Glad to know the "Golden Age of Comedy" did so well for you, its amazing - just a few reels of old 'clips' thrown together, it goes to show you, the fabulous cost of the films they are producing today are not of interest to the public. I do'nt think they care how much they cost, the fantastic expenditure does'nt guarantee popular entertainment - there are exceptions of course, but the majority of stories & plots are not worthy of the money spent on them, & consequently have little appeal to the general public - I feel the producers are making a great mistake in trying to make every picture a spectacular, am sure the public would prefer simplicity & down to earth fare. It would too cost less to see them, better for all concerned. This is of course my humble opinion of the situation. I also feel the films are too long in length & can become boring, especially if the story is weak & uninteresting. Note E.W. 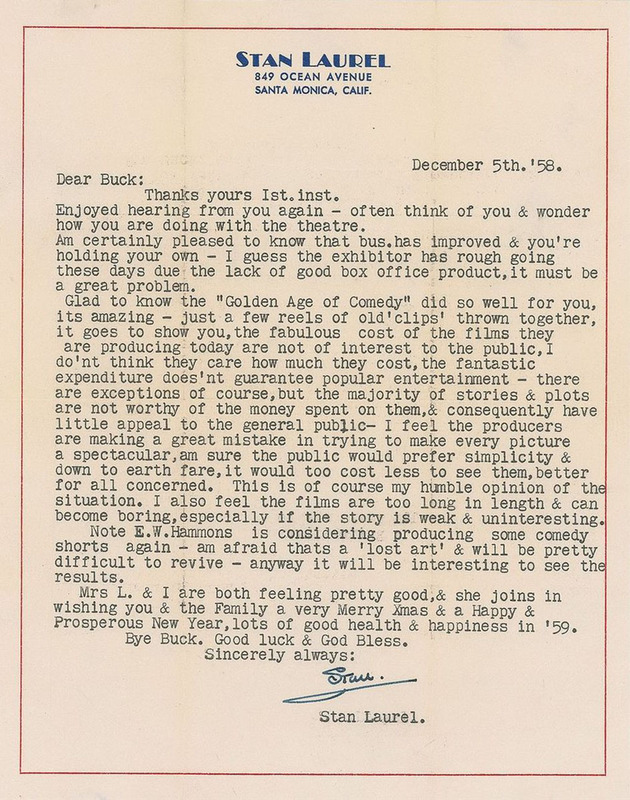 Hammons is considering producing some comedy shorts again - am afraid thats a 'lost art' & will be pretty difficult to revive - anyway it will be interesting to see the results. Mrs L. & I are both feeling pretty good, & she joins in wishing you & the Family a very Merry Xmas & a Happy & Prosperous New Year, lots of good health & happiness in '59. Bye buck. Good luck & God Bless. Produced by Robert Youngson, The Golden Age Of Comedy (1957) was a compilation film featuring scenes from some of the best-known comics of the silent era including Laurel and Hardy, Ben Turpin and Harry Langdon. Youngson followed up this success with When Comedy Was King (1960), Days of Thrills and Laughter (1961), Laurel and Hardy’s Laughing 20’s (1965) and 4 Clowns (1970). E.W. Hammons was the vice president and general manager of Educational Pictures, a studio that produced slapstick comedies in the ’20s and ’30s starring Lloyd Hamilton, Harry Langdon and Buster Keaton, among others. I had a letter from Steve Allen a couple of weeks ago. Told me a couple of his comics were going to do an impersonation of Laurel and Hardy on one of his coming shows. Am terribly sorry to hear about your great disappointment re the mix up of the building deal - I know how much you had looked forward to the new home & all the plans you had made for the construction, it must have been very upsetting for you. Anyway, it looks like the Thompson outfit have been the cause for all this trouble by not paying off the loan as they had agreed to assume - did'nt you have this stipulated in the contract with them - it seems to me they would be liabel if they had signed to that effect & should be responsible for it. You just can't trust people these days - thats why I suggested that you file a completion bond when the deal was first set up, so that you would have had protection against these happenings. I think you are wise in deciding to call it all off & fix up your old place instead, am sure you'll be much happier not being under obligations & be under pressure to make monthly payments for the next 20 years, plus a high rate of interest. Your place is practically clear now so you have nothing to worry about - why burden yourselves with a lot of debt, am sure with the improvements you are going to add to the house will make a great difference in effect & comfort, especially the content of knowing its all paid for & belongs to you. Frankly, I think you were very fortunate that the deal did'nt materialize for a new house, it might have brought you a lot of grief. Yes, that Chicago school fire was a shocking thing, terrible for those families who lost their children - what a tragedy. The Malibu fire was pretty bad too, I understand around 40 big homes were destroyed - the fire spread across the Coast highway in the direction of the place where we used to live - sure glad we were out of there. Hope by now you are over your disappointment & do'nt feel so bad about it. I think you are lucky to have escaped being involved, it would have been a great mistake. Will look forward to hearing the stories about Louis & his Bar- I imagine many funny things happen there when the gang get together. Enclosed clipping was sent me from back East somewhere - a reporter came to see me for an interview last month - do'nt know what for? anyway, thought you would like to read it. I think they keep these articles on hand to use only when they need to fill in some space for a dead-line issue. 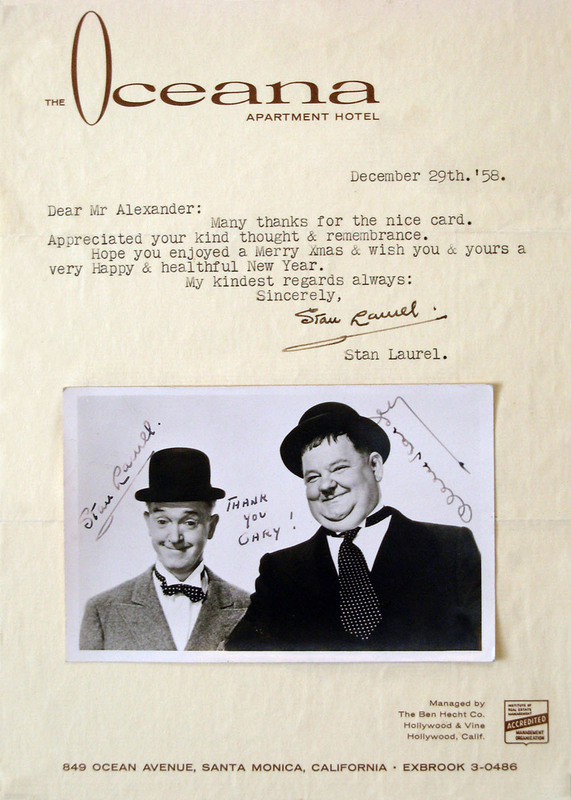 Am not sure if I told you or not, I had a letter from Steve Allen a couple of weeks ago, told me a couple of his comics were going to do an impersonation of L&H on one of his coming shows. He did'nt know what date, so keep on the lookout for it, it should be interesting. Think thats about all for now. Eda joins in love & best to you both. Take care or yourselves & keep well. P.S. I just read in 'Variety,' Sid Van Kuren had quit Roach's understand he is in very bad health - serious operation etc. The prison film you mention was titled ‘Pardon Us.’ That was our first full length picture. Glad you liked it. Nice to hear from you again. Yes, I had the pleasure of meeting Mrs Alice Campbell, she is a very nice person & I enjoyed her visit very much - Mr Campbell was'nt able to come with her, he was busy at his work, but she brought another nice Lady, who I understand also comes from Rhode Island - I do'nt recall her name, but she lives near Mrs Campbell in Santa Ana. The prison film you mention was titled "Pardon Us" that was our first full length picture - glad you liked it. Sorry you got the wrong copy of "Lazy Moon" - the title is the same as Mr Hardy sang & it was published around 1910 I think, being nearly fifty years ago, its probably out of circulation by now & would be difficult to find. I frankly do'nt know the lyrics of this number, the first & last time I heard it was when Mr Hardy sang it in the film, & that was only one verse & Chorus of it. The Jimmy Finlayson you mentioned appearing in our films, am sorry to say, died in '53. Yes, I made many silent films before I met Mr Hardy, but not having seen the "Golden Age of Comedy", I do'nt know if the scenes you refer to were me or not. If you could tell me what they were about, I might probably know if it was me. I worked single for about ten years before I teamed with Mr Hardy. All for now Glen. Wish you a very Merry Xmas & a Happy New Year, lots of good health & happiness in '59. Many thanks your nice letter & card, also for the records, am certainly looking forward to listening to them - unfortunately I do'nt have a record player here at the Apt. mine is in storage at present. So I'll have to wait a while before I can hear them. However, I appreciate your kind thoughts and trouble in making them up. Regarding the L&H films, there is a firm called the 'Blackhawk Films' 1515-19,Main Street,Davenport,Iowa. I understand they have a big supply of our films & if you send a card to them, they will send you a catalogue listing of what they have in stock - if they have'nt got what you want, maybe they could help you locate it - they carry both silent & sound 16 mm. Mrs Laurel joins in wishing you all a wonderful Xmas & a Happy Prosperous New Year - we shall be thinking of you all, & will drink to your health on Xmas Eve. Yes, Costello is Costello, no matter what character he plays. He can never hide his identity. Note you decided not to take issue with that obnoxious Gentleman that caused you so much trouble - maybe you're right in not getting further involved. Am afraid I would feel different about it & would have been very vindictive in the matter - in some instances, its noble to turn the other cheek, but not with that monkey, he deserves to be 'Ham strung & Quartered' for making such a vicious attack on your reputation & character. It sure burns me up to think about it. I really do'nt know which particular film I actually liked on the whole, there were scenes & parts in all of them that gave me satisfaction, but none of them (the films) I ever thought were perfect. Thanks for the compliment on the stationery. I'll soon have to order a new batch, but will change the design & paper next time, I get tired of the same thing each time. I have'nt heard any further from Steve Allen re the L&H skit they intend doing, will let you know if I hear in time, but you'd better keep watching for it in case. He may be busy working on the show rehearsals & might forget to let me know. I'm keeping on the lookout too, do'nt want to miss it. Gleason's half hour shows have'nt been too good, he seems lost without Carney - I'll never understand why they split up, they are both suffering for it. Yes, Costello is Costello no matter character he plays, he can never hide his identity. I sure was glad we moved from Malibu, that really was a bad fire - worse than the one in '56. the place where we lived was right in that area & was badly threatened, I understand it came within a couple of blocks of the building. Regarding leaving your family. In show Bus., we do'nt think anything of it, thats part of our life, we treat it as a normal procedure - just like you leave your home every morning to go to your place of business - when our job is done - we return home - distance means nothing - we always figure to be back whenever possible & if necessary, regardless of where your work will take you - in my case, I left England in 1912 & did'nt return (2nd.time) to see my folks again till 1927. I do'nt think you should worry in going to Arizona as far as your folks are concerned, that is'nt far away these days with this modern mode of travel & the wonderful Phone service, its just a matter of a very few hours to get back to Pensylvania should it be urgent - you probably do'nt see them often anyway, even as close as you are - I certainly would'nt feel disturbed about it Earl. Yes, young Charlie Chaplin is around - he got married about a year ago & his wife had a baby, but I understand they are now getting divorced - sounds like his 'old man', a chip off the 'old block'. I think he works mostly in theatre shows - stock companies etc so thats the reason you do'nt hear much about him - he looks very much like his father in photos I've seen of him. His Brother Sidney is doing very well in New York Shows, playing featured roles he's appearing there now in some Broadway production, before this he played one of the Leads in "The Bells Are Ringing", I hear he is very good & quite talented - he looks like his Uncle Syd Chaplin (Charlie Sr's Brother) tall & good looking. The Downtown Street scenes you see in the LA. & SF. police films are taken with a hidden camera - people do'nt know they are being photographed, the camera is concealed in a car - its very effective is'nt it? I met Noel Coward once in Manchester England in '52. He was dining with Lunt & Fontaine at the hotel - they were playing in one of his shows which had just opened - I was just introduced to him, so did'nt have a chance to talk with him at the time. I saw his "Cavalcade" show at Drury Lane in '32. it was a magnificent production - I agree with you, he is a genius - amazing talent. All for now Earl. Mrs L. joins in wishing you all a very Merry Xmas & a Happy New Year, lots of good health & Prosperity in '59. Charles Spencer Chaplin III (1925–1968) was the eldest son of actors Charlie Chaplin and Lita Grey. He married actress Susan Magness on August 6, 1958 and divorced on November 23, 1959. Noel Coward (1899-1973) was an English playwright, composer, director, actor and singer. Alfred Lunt (1892-1977) and Lynn Fontanne (1887-1983) were an American stage acting team. Many thanks for the nice card & letter, also the enclosures - I got a big kick out of the card from 'Louie', he's really a great character - I dropped him a line, & sent him a picture. Note re Sam Hearn being on the Jessel show tonight - I never miss that program, its very interesting to see some of the old 'Timers' he interviews, I enjoy it very much. Am enclosing a clipping out of a recent issue of 'Variety' re Sid Van Kuren quitting Roach's, & 'Bones' Vreeland being promoted to the 'Top Brass' - thought this would interest you Wayne as you've know him for so many years. Hope you had a nice trip to Bakersfield, that was a nice change for you, does you good to get away for a few days. I got a laugh about the dogs spending the week-end in High Society, the diamond collar class - very cute. Do'nt know if I already conveyed the Season's greetings or not. Anyway, again wish you a very Merry Yuletide & a Happy, Healthful & Prosperous New Year,lots of good luck in '59. Bye now, & God bless you both. Eda joins in love & kind thoughts. Sam Hearn (1888-1964) was a semi-regular character on Jack Benny’s radio program, normally playing Schlepperman. Even though he appeared on Jack Benny’s TV show several times he only appeared as Schlepperman once. He also made appearances on I Love Lucy and Make Room For Daddy. He started his career in The Greenwich Village Follies, which opened at the Shubert Theatre on May 10, 1926. I, too, am in the same boat as you—have to get along on a fixed income—a small Life Annuity and Social Security check each month. Thank God for that! Glad to know Jack that you are going to get busy with that pully routine - when you feel a bit tired, just rest for awhile, do'nt overdo it, thats not good for you - take it easy & gradually, to start with, do'nt make the weight too heavy, then increase it as often as you feel able to pull it up & down. I used to take this exercise twice a day, - morning & afternoon, & slowly raise the amount of pulls each time, I went from 10 & finally reached a 100 without any effort - this gave me a lot of confidence & I made wonderful improvement. I also exercised on an indoor bicycle, this helped my legs a lot & I was soon able to stand up without cane or crutches. I sincerely sympathize with you in regard to the financial situation - thats the tragic part of it all. This same thing happened to Mr. Hardy, his illness cost over thirty thousand Dollars in 11 months, even lost his home, it had to be sold to pay medical expenses - its shocking to end up like that after all the years of hard work. I too am in the same boat as you, have to get along on a fixed income, a small Life annuity & Social Security cheque each month (Thank God for that.!) I do own a home however, but I rent that & live in a small Apt. otherwise I would'nt be able to get by. Many thanks for the nice card & the lovely box of cookies - it is very sweet of you to go to all that trouble & I deeply value your gracious gesture - wish I could fully express my appreciation. 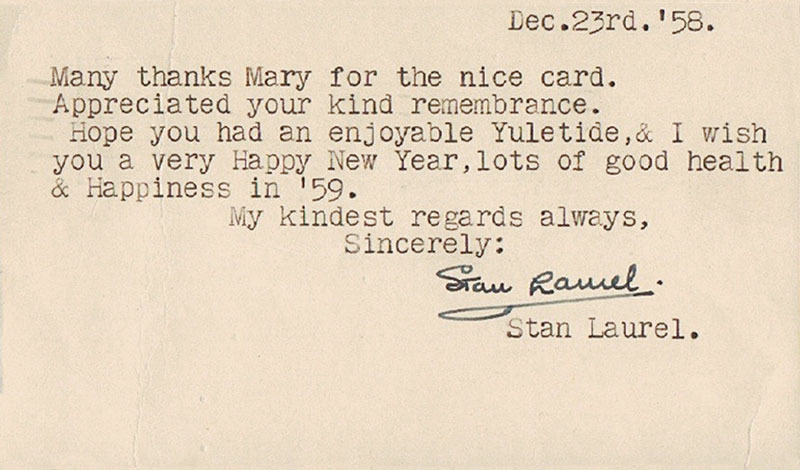 Mrs Laurel too joins in wishing you & bob & your Mother a very Merry Xmas & a Happy New Year, lots of good health & happiness in '59. Trust alls well & you will all enjoy a wonderful Yuletide. Again thanks for your kindness. Many thanks for the lovely gift of flowers which arrived this AM - certainly very sweet of you & deeply appreciated. Mrs L. (Eda) joins in wishing you & family a very Merry Yuletide, lots of good health & happiness in '59. Trust you are well & the New Year will prove successful & prosperous in your theatre business. Thanks for the nice card. Appreciated your kind thought & remembrance. Mrs L. too joins in wishing you a very Merry Xmas & a Happy New Year, lots of good health & Happiness in '59. Trust alls well with you Elmer. Many thanks Mary [Maynard] for the nice card. Appreciated your kind remembrance. Hope you had an enjoyable Yuletide, & I wish you a very Happy New Year, lots of good health & Happiness in '59. Dear Earl [Shank, Jr.]: just to let you know, the L&H skit will be presented on the Steve Allen show, Sunday Eve, January 4th. Trust you enjoyed a Merry Yuletide. Mike Todd wanted us to appear in ‘Around the World in 80 Days,’ but we were both very ill at the time and were unable to make it. Thought the snapshot was very good, I think you do resemble me - maybe with a derby it would be much better. No, the critics were never too enthused about L&H, but it never bothered us, we preferred the Public's opinion, after all they are the real critics, if they liked us, that was the main thing & all that was neccessary as far as we were concerned. There was never any rift between L&H over anything - do'nt understand what you mean, we were very close friends in all our 30 years of association. You mention that "Pardon Us" was a silent film - that was our first Feature length in Sound. Mrs Laurel & I have been married since '46. Yes, I appeared many times in New England - many years ago when I was in Vaudeville - before I ever met Mr. Hardy. The late Mike Todd wanted us to appear in "Around the World in 80 Days" film, but we were both very ill at the time & were unable to make it unfortunately. 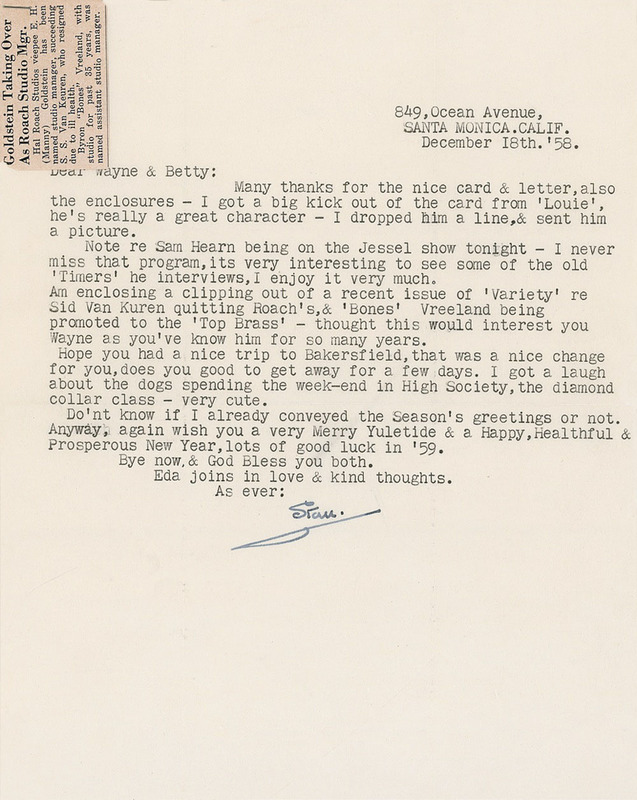 No, I have'nt seen Billy Gilbert for a long time, I saw him last a few years ago at a party at Eddie Cantor's home in Beverly Hills, Have only seen him since on TV. Well I think this covers your questionaire, so all for now. Hope you had a nice Xmas & wish you a Happy & Healthful New Year. Around the World in 80 Days was a 1956 adventure film produced by Michael Todd and released by United Artists. It was directed by Michael Anderson. The movie was based on the classic novel of the same name by Jules Verne. The film boasted a huge cast, with David Niven and Mario Moreno “Cantinflas” in the lead roles. Over 40 famous performers made cameo appearances, including Marlene Dietrich, George Raft, and Frank Sinatra. Many thanks for the nice card. Appreciated your kind thought & remembrance. Hope you enjoyed a Merry Xmas & wish you & yours a very Happy & healthful New Year. The great moments of magic that really kick you in the heart, churn your belly and raise the hackles of your scalp can be totted on your fingers to an exact total because they remain with you all your life. My greatest was when the matron told me over the telephone that my wife had produced a daughter. 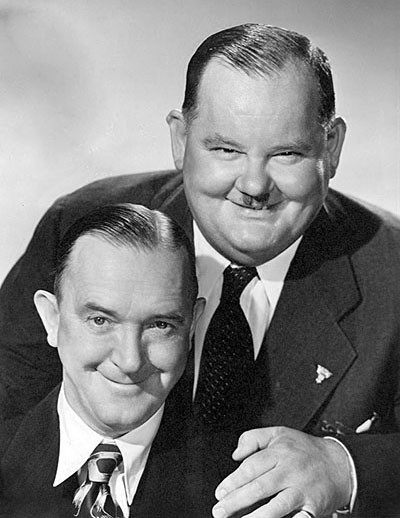 My next greatest was when Oliver Hardy walked on from the left wing and Stan Laurel walked on from the right. The pit orchestra played “The Dance of the Cuckoos” and the feeling in that packed theatre was so thick and fat you could hold it in your hands if they weren’t so slippery. They let the music play just that much longer than you'd expect, then on they came, baggy Olly, all trousers and Stan with that swinging stride. Really, they didn't need to do any thing more, and they shouldn't have, because they were so old now. They were red and puffed before ten minutes were up. The applause was unending. Afterwards I went round the back and through the stage door of the old Brixton Empress, along with Tony Hawes. He and I were just trying out a writing career, and had big hopes. We even had cards printed “Gifford and Hawes—for your scripts. Of course.” Wow! On the strength of the idea we got to talk to Stan, the man, in his dressing room. He was very tired. Olly was nowhere to be seen, and finally, on the way out, we peeked through the open door of the next dressing room, and there he was, very red, very plump, and very sweaty. He flashed us a glance as we paused, but he looked sort of fierce and busy at his sweating, so we hurried on. I can’t remember a word Stan said, but I do have a small postcard picture of them, which he signed for me. Tony had one too. Oliver had already signed them, in advance, so only Stan signed in person, as it were. I can see the whole thing still, feel the heat and hear the garbled noises of backstage busyness, but I can’t recall a word Stan said, or a word we said. The idea never came off, and Laurel and Hardy never moved to the moon. A pity, not for our sakes (our writing-partnership blew up a long time ago) and not for my sake—but for L&H lovers everywhere’s sakes. For as far as I know, they never made a single broadcast in a comedy show, certainly not their own comedy show. How great such a tape of such a show would be today! Frankly, I don’t think I, or we, would have been really right to write for them; not at that time, any way. Certainly, my love of them has only really blossomed in these latter days of becoming a film collector. Actually having their movies, and having a book like Professor McCabe’s pioneering work (exasperatingly inadequate as it really is) to study along with the movies, being able to run their early silents chronologically and watch the development of undoubtedly the greatest double act in cinema. This is what has made me the L&H fan I am today.